Senior Author: Ayman Al Habeeb, M.D. Cite this page: Redpath M Orf. PathologyOutlines.com website. 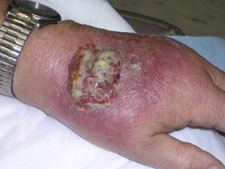 http://www.pathologyoutlines.com/topic/skinnontumororf.html. Accessed April 25th, 2019. Which of the following diseases is caused by a DNA virus? D. Orf. The other diseases are caused by RNA viruses. Which of the following is true regarding Orf? D. True, inclusion bodies are typically present.